Even as a kid, mismatched scale characters never really appealed to me. 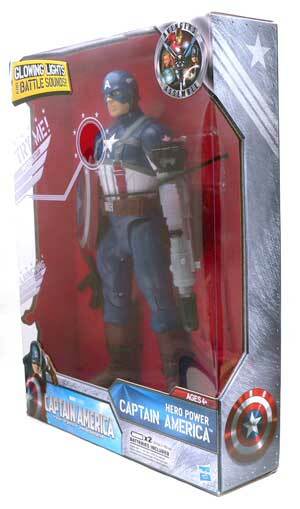 I understand the kid appeal of these larger figures, especially with a movie character like Captain America. Thanks to the folks at the Regal Movies on Twitter, I won one this guy through a trivia contest related to the new film. 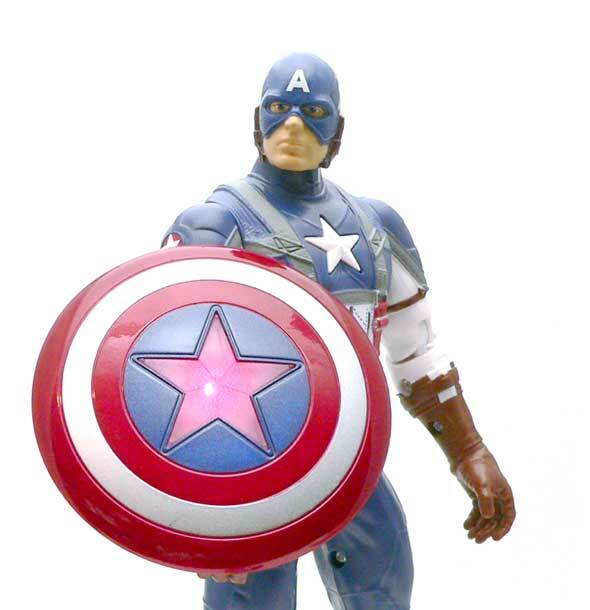 There is no mistaking this is the movie version of Captain America. I’ve wondered about these types of figures, so it was nice to get one in hand to play with. 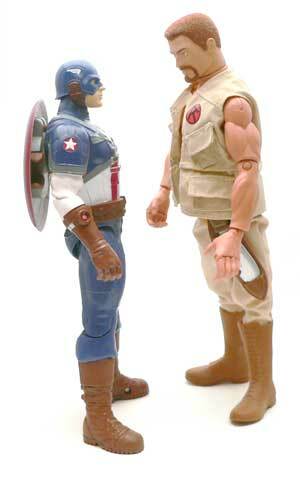 First of all, I want to say I was wondering how much he would be like the Remco “Powerized” Captain America from 1980. Which was basically a solid body figure with a built in winch. Check him out in this vintage advertisement at PlaidStallions.com. 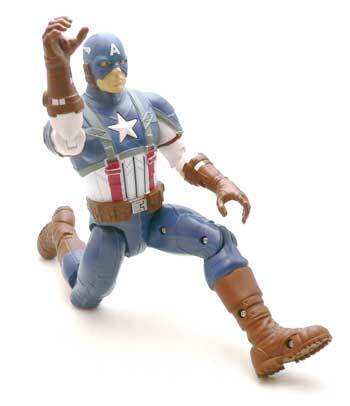 However, this figure has benefited from much improve articulation. He’s got knees, hips, shoulders, elbows and wrists. Top that off with a balljointed head. 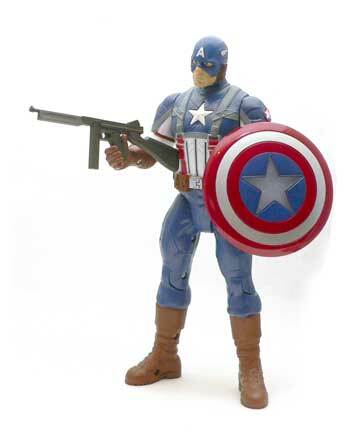 I’m not going to say he’s a Marvel Legends figure, but it’s far more than the basic 5. As you’d expect with this kind of kids figure, the whole figure is molded in blue or white with painted details. There’s no fancy washes or the like. The paint work ranges from not bad to sloppy depending on the portion you are looking at. I have to say that the eyes aren’t half bad. The straps and pouches on the body are done well enough. You can even see little D-rings where the shoulder pads are strapped to his arms. The buckles on suspenders have some sloppy silver paint slapped on sculpted slides. The one thing that seems a bit odd is the stitching is really oversize on his girdle. Yeah, it’s needed for the design, but this just seems really big. Almost like there should be leather laces connecting the pieces like a moccasin. It give the piece some texture which is good, but I wish it was just a little bit smaller. As with any new toy these days, there has to be an action feature. Cap’s action feature is light and sound. Press the star on his chest and he says various phrases. Simultaneously, the accessory on his right arm lights up. I have to give the designers credit on this one. Both the light on his arm and the start are blended in well. If you weren’t looking for them, you might not realize they were there. And speaking of the accessories, the first of which is the obvious one, his shield. It’s sculpted on both sides and isn’t too bad. The handle and wrist cuff swivel back out of the way. This lets you swing out a peg to attach it to his back. The picture at the top is faked slightly, but looks pretty darn close to how the feature looks. The other light up article is an energy weapon that shoots a deadly grappling hook. Okay, maybe not. The light up feature doesn’t work nearly as well here. Only the scope portion of the weapon lights up, and it’s a bit too thick to light up well. A little loop where you could tie some string on the hook would have been nice, as well. So what did I think of Cap overall? He’s not bad for what he is. What he is a kids figure. He seems to be durable. He lights up and talks. Really for a kid with imagination, he’d could be fun. However, in today’s age of toys, I’d be surprised if even a kid would want a figure that he didn’t have anybody else to interact with. I can see a bunch of grandparents buying these with nostalgia over their vintage GI Joes as birthday gifts. Don’t fret. He does have some fun points. 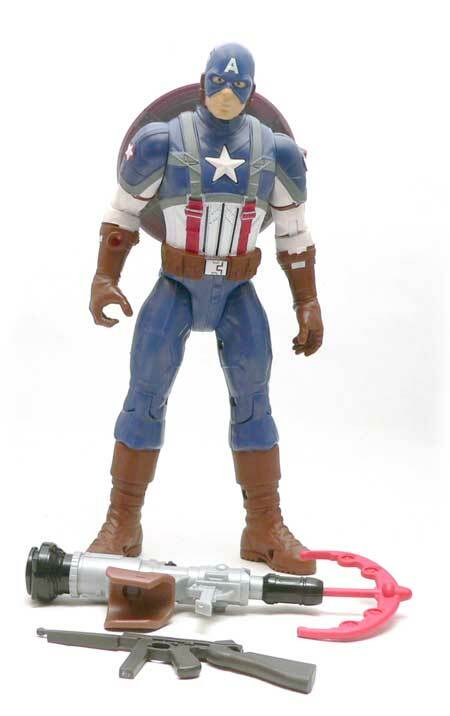 Worst case using with your Marvel Universe figures as a Captain America that had take a giant man potion. Because of his size, he might actually look good behind some shorter figures on a shelf, as well. Mmmm. Interesting piece. Not bad as a gift for young children, I think. I just don’t know. The scale is so odd, I’d have a hard time giving it as a gift.